Lightning storms out at sea are becoming more common, and it seems that human activity is the cause. Research by scientists at the University of Washington has found that diesel emissions from cargo ships could be to blame. 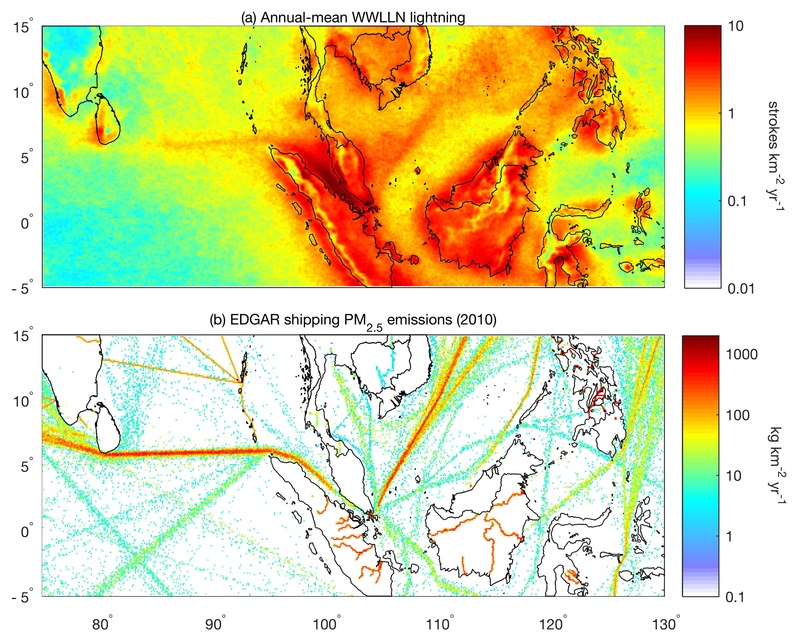 The team compared twelve years of data collected by the World Wide Lightning Location network with some of the world’s busiest shipping lanes. It was found that nearby stretches of water with similar climates experience fewer lightning storms than those that saw heavy nautical traffic. “All we had to do was make a map of where the lightning was enhanced and a map of where the ships are traveling, and it was pretty obvious just from the co-location of both of those that the ships were somehow involved in enhancing lightning,” said lead researcher Joel Thornton in a press release. Clouds are formed when water vapor clings to particles lingering in the air. Diesel exhaust fumes offer up a wealth of particles for the vapor to latch onto, which makes for clouds that are lifted higher into the atmosphere. There, they can amass the electrical charge that leads to lightning storms. The study looked at some 1.5 billion lightning strikes that took place between 2005 and 2016. Based on their findings, the researchers believe this to be the first hard evidence that human influence is responsible for increased cloud formation over our seas and oceans. While some might still try to deny that human activity is a key component of climate change, studies like this one demonstrate that this is not the case. What’s more, diesel is a particularly large contributor. A recent paper stated that 38,000 deaths per year can be directly linked to diesel exhaust gases. Between its damaging effect on the environment, and its potentially fatal consequences for human beings, it’s no surprise that various entities are trying to phase the fuel out. In December 2016, it was announced that four of the world’s ten biggest cities will have banned the use of diesel within the next decade. Moreover, various countries around the world plan to enforce a ban on all new gas- and diesel-powered cars by 2040. However, this research goes to show that cars powered by diesel aren’t the only culprit. Hopefully, cargo ships powered by alternative fuel sources won’t be far behind the world’s first all-electric yacht.